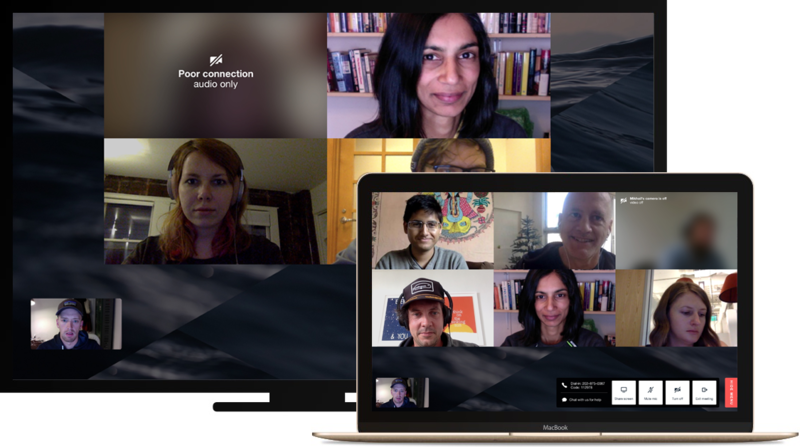 In order to give Daily.co users like yourself the best possible experience you may, at times, see a "Poor connection" message overlaid on a participants video feed—as illustrated below. Example of "poor connection" messaging during a video call on a TV (left) and computer browser (right). Feeds with poor connections are blurred. There are a few instantiations of the poor connection message, yet in all scenarios, when we detect a poor network connection between participants—or multiple participants—video feeds may be temporarily turned off until a stronger connection is detected. This is done to ensure that everyone in a Daily.co meeting will have the best quality experience possible, based upon their respective internet connections. Don't worry though! In all scenarios, audio will still be sent so that everyone can still hear you—as long as your microphone is turned on. Note, that video may temporarily be turned off in only one direction—based upon the network connections of both yourself and another participant. Meaning, if you can see someone they may not be able to see you. In this scenario you would see the other participant with a badge that reads "Poor connection, this person cannot see you".